POKHARA, Oct 25 : Tourists in Nepal’s city of lakes now will get additional facility of sightseeing through the use of gyrocopters introduced by Heli Air Nepal. It ha now marked the start of yet another adventure tourism product in the lake city after paragliding and ultra light aircraft. The company started commercial service with the one-passenger rotary-wing aircraft more than a month ago after receiving an operating license from the Civil Aviation Authority of Nepal (Caan). The service has buoyed tourism entrepreneurs in Pokhara who expect the new product to attract more thrill seekers to one of the most famous tourist destinations in the country. According to Ronan Lamichhane, managing director of Heli Air Nepal, the company currently flies two French-made gyrocopters, and plans to bring another one soon. It operates seven to eight flights daily. “Around 90 percent of our clients are foreigners and the rest are Nepalis,” said Lamichhane. “A majority of them go on the flight to enjoy panoramic views of the mountains around the city.” Passengers can get a 360-degree view of the scenery from the aircraft, so the flight is very popular among those who want to take photos and videos, added Lamichhane. Heli Air Nepal charges $149 for a 15-minute flight, $249 for a flight lasting half an hour, $398 for an hour-long flight and $548 for a flight lasting one and a half hours. According to the manufacturer’s website, a gyrocopter can even be flown in strong winds and weather conditions, and can be used practically round the year. It is a type of rotorcraft that uses an unpowered rotor in autorotation to develop lift, and an engine-powered propeller, similar to that of a fixed-wing aircraft, to provide thrust. Although a gyrocopter can’t take off vertically like a helicopter, it can land—depending on wind speed—within a distance of zero to 30 metres and can deal with strong winds and turbulence in mountainous areas. The company claimed that as the aircraft has a double petrol-powered engine, it can land anywhere in an emergency. The gyrocopter can fly at a height of up to 18,000 feet. “However, we operate flights only up to 12,000 feet as we would require artificial oxygen to fly higher than that,” said Lamichhane. A gyrocopter can fly continuously for 3 hours and has a range of 800 km. 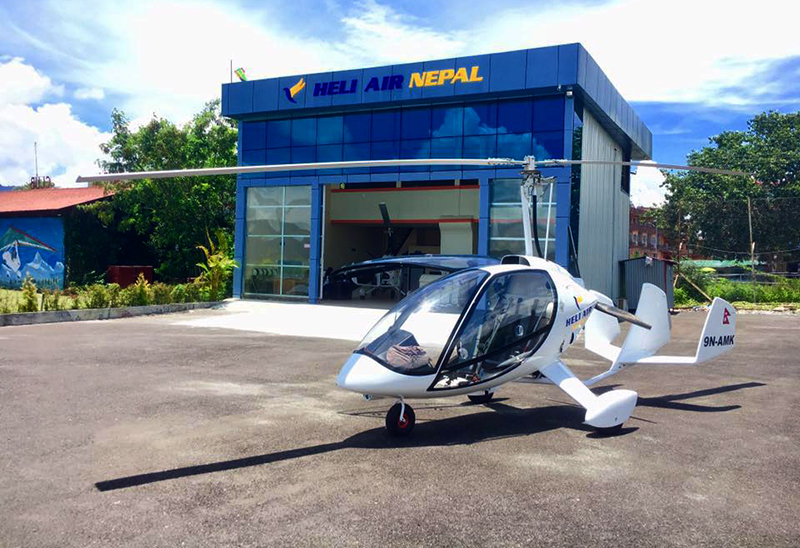 Heli Air Nepal has claimed that it is the first company to operate gyrocopters in South Asia.